About 2nd Primary School of Vrontados "Panagias Erithianis"
The 2nd Primary School of Vrontados “Panagias Erithianis” is located in the north-east part of Greece, next to the Greek –Turkish borders, in a small town (Vrontados), on an island called Chios. The school was build in 1913 and is an old, high-ceiling, neoclassic building made of stone, which has some facilities problems: i.e there is no gymnastics facility and no recreation classroom.There are six classrooms, one teachers’ office, a library, a classroom for children with learning difficulties, a computer room and one for the afternoon school. 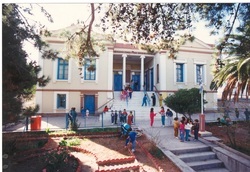 The school was named after the near-by church called “Panagia Erythini”(which means Virgin Mary Erithiani) and it is one of the 3 primary schools of Vrontados. Originally, there were only three teachers teaching in the school and only 3 classrooms, (2 class levels per classroom). Now there are 6 teachers, one for each classroom. In our school attend 105 pupils, aged 6-12, among them children from other European countries (mainly Albania and Bulgaria), repatriates, as well as Roma children. There are approximately 20 students per classroom. Moreover, the school staff in the morning school (08:15-14:00) consists of 13 teachers, among them the Head teacher, a teacher for children with learning difficulties, a Gymnastics teacher and three teachers of foreign languages (English, French and German). Furthermore, at 12:30 starts the afternoon school, which finishes at 16:15. There are 23 pupils from all classes in the afternoon school. It is optional and its aim is to help children study their lessons. Moreover, children have the opportunity to attend English, Gym, Dance and Computer classes. Additionally, our school is in the process of organising and presenting environmental and cultural projects every year.